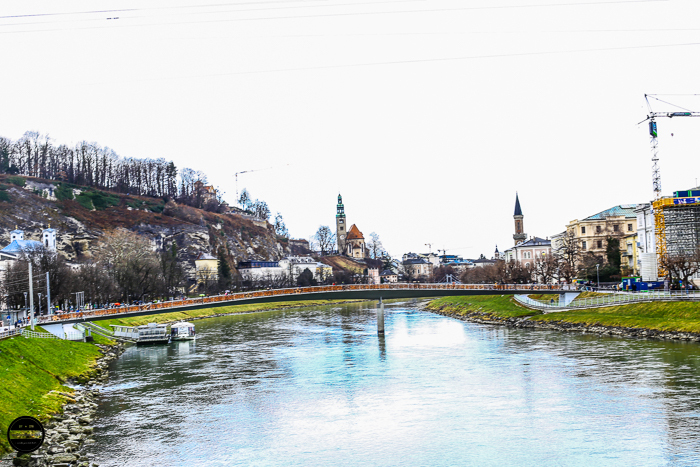 Jagruti's Cooking Odyssey: Salzburg ~ Stage of the World! Salzburg is the fourth largest city in Austria and is situated on the Northern edge of the Alps. 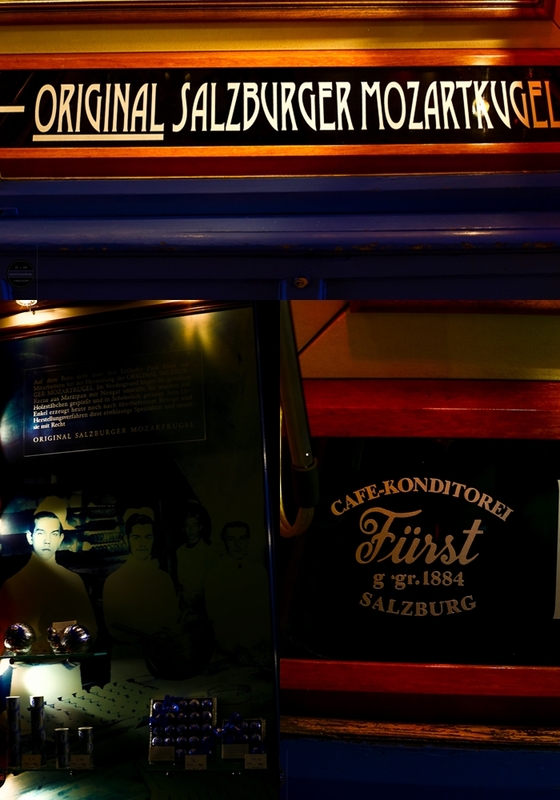 It is surrounded by lakes and mountains and straddles the banks of the Salzach river. 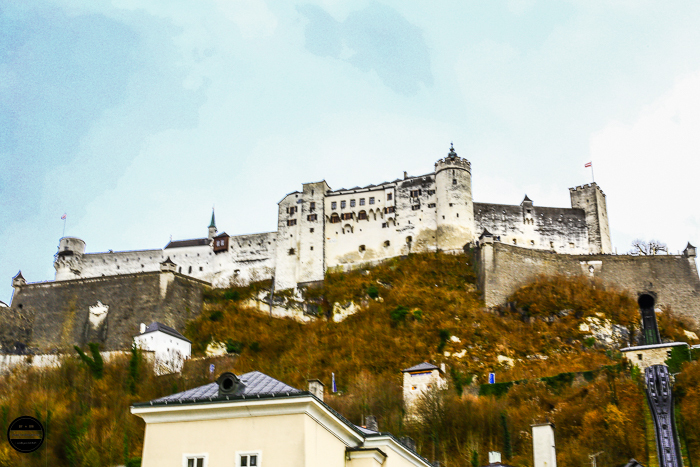 Salzburg has a rich musical heritage and is the birthplace of Wolfgang Amadeus Mozart. 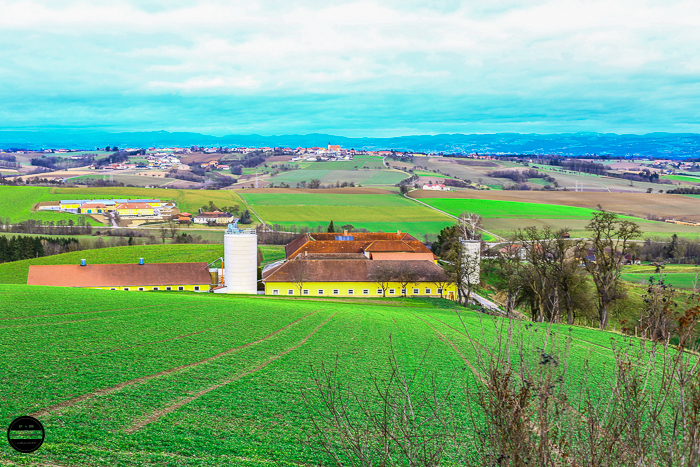 Its fairytale setting of stately homes, churches and hillsides made it perfect for one of the most loved musicals in the world - The Sound of Music. We had another early morning as today we were off to do a guided day tour to the panoramic Salzburg from Vienna. We booked our tours early from London. For today, we didn't have to do any planning of our own except sit back and relax in the coach. 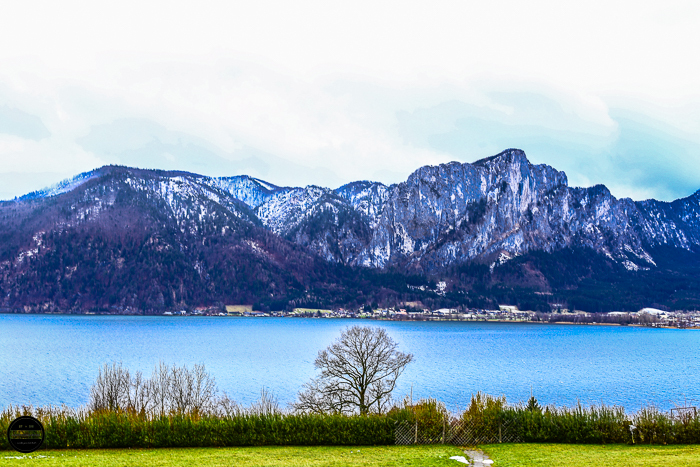 Of course, you can travel by train from Vienna to Salzburg. We were explained by our tour guide that the name Salzburg means "salt castle", from the salt traded along the Salzach river. He taught us a lot about Austria during our coach journey - Vienna is made up of 23 districts and 11 languages are spoken but German remains the main language. We learned that Mozart was buried in an unmarked grave, meaning that no one knows the exact location of where Mozart lays. 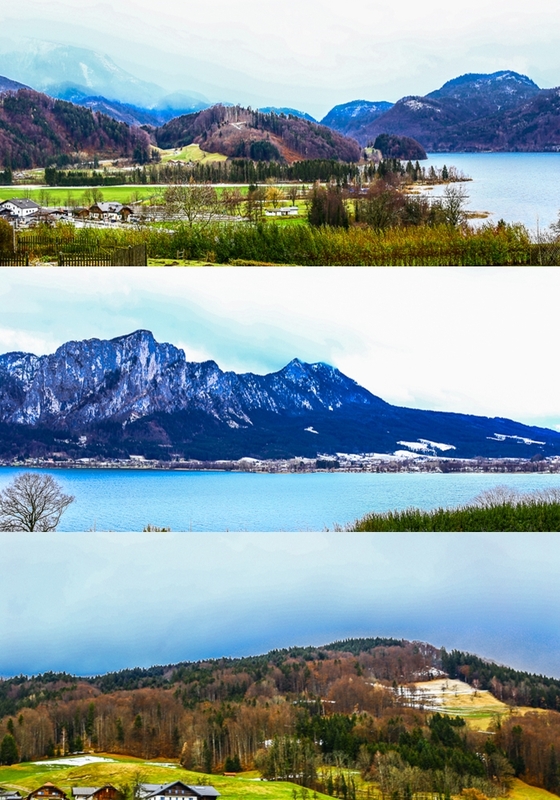 Our journey through snow-capped mountains and valley, along with useful information from our coach guide and listening to the classical music of Mozart brought us to the most enchanting Austrian Lake District - Salzkammergut, where you can witness clear turquoise water, snow-capped mountains and greenery in every direction, mother nature at it's best, simply too perfect for words. It was our bad luck that that day we had the worst weather. We could not step out of the bus so we hardly took any pictures - our brain had to be our camera and make the memories instead. After 4 hours journey, we reached Salzburg. 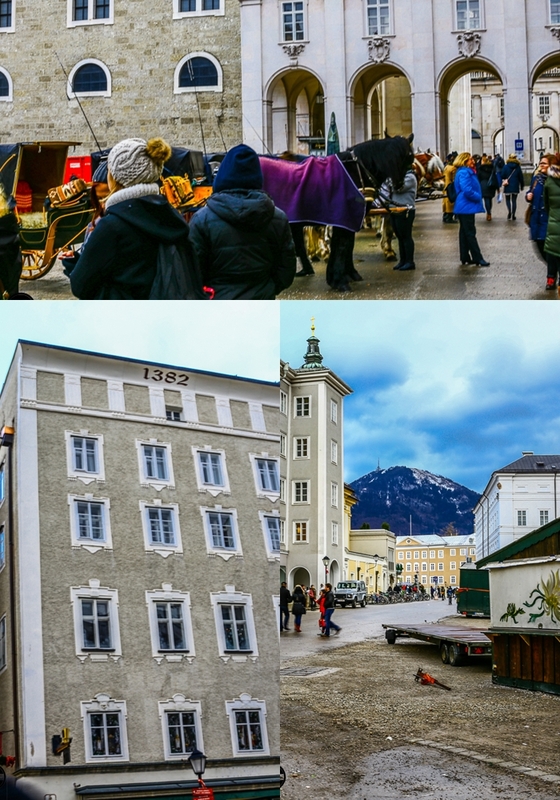 We first had a guided walking tour of Salzburg, then some free time to explore ourselves. The guided walking tour was done by a local tour guide. 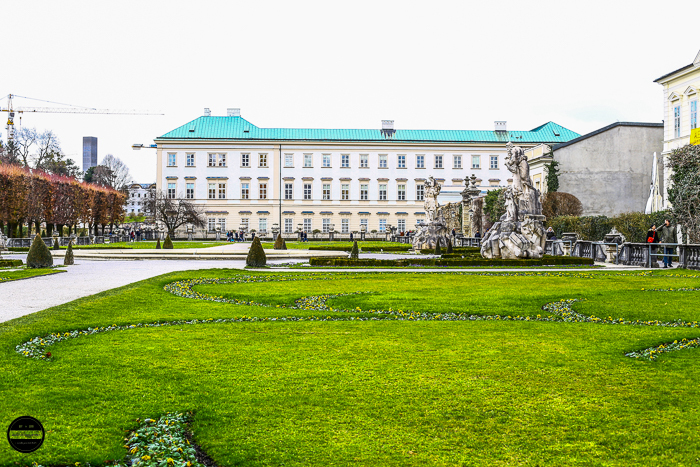 We visited the beautiful and calming baroque style Mirabell Palace first. The gardens seemed like a lovely place to sit and watch people go by if we had more time. I could only imagine just how beautiful it all would have looked in Spring and Summer with all of the flowers in full bloom! 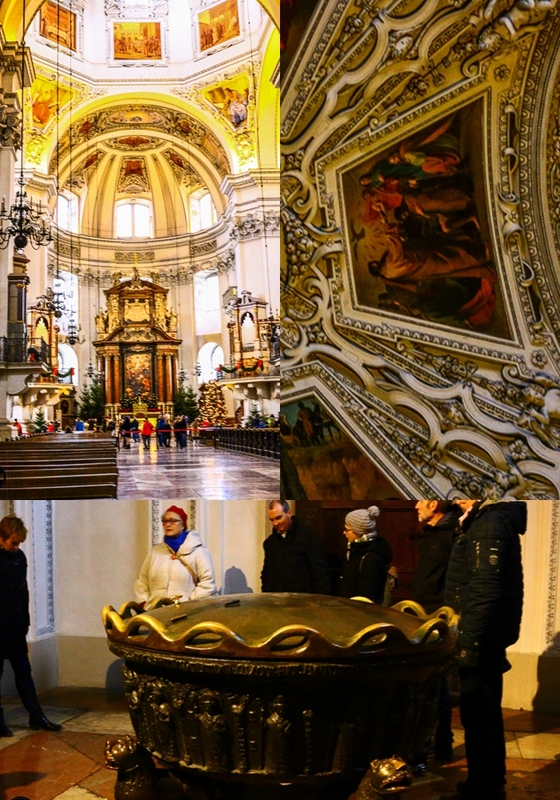 Taking a short walk from Residenzplatz, we got to the pink-marbled Salzburg cathedral. Inside was enthralling. It was probably the most at peace I had ever felt in any cathedral even with a large number of public inside of it. It was also where Mozart was baptised. We reached Mozart's birthplace and you could tell we had arrived there and there was a large gaggle of tourists all trying to get a photo! I was happy to know that his birthday was only one day away from mine! 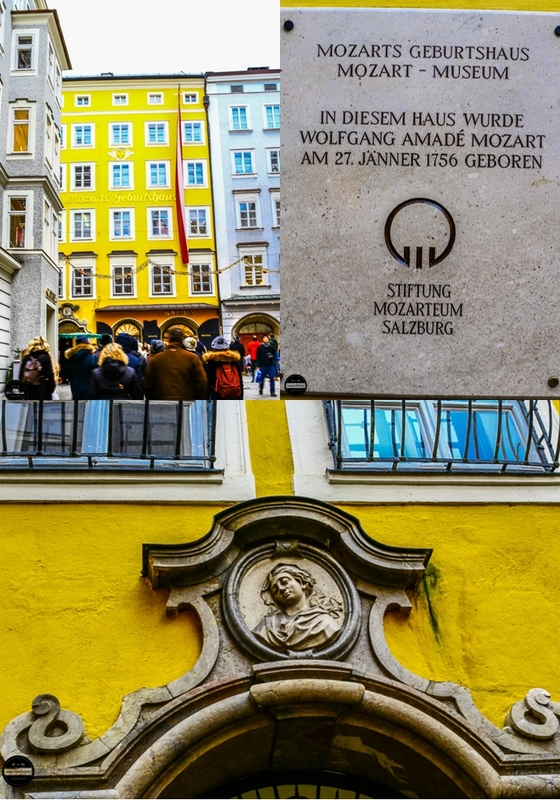 Mozart's birthplace is No 9 on the Getreidegasse, where he and his family lived on the 3rd floor. Getreidegasse is a narrow but busy shopping street filled with international shopping chains but still maintains centuries of tradition and craft. The street is lined with beautiful doorways with many through-houses leading to other streets and squares. We loved the intricate guild signs hanging from the buildings. This was the perfect spot for a quick lunch before we carried on sightseeing. No trip is complete without savouring local food. 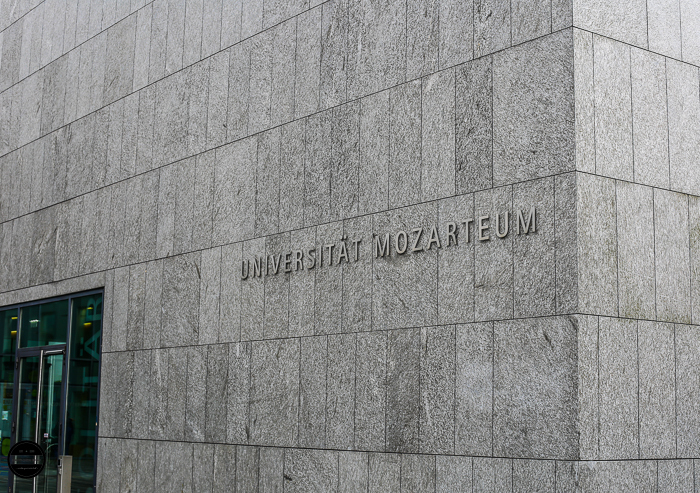 We visited Salzburg Mozartkugal, which is 130 years old. Still, to this day, Mozartkugel or Mozart chocolate balls are created by hand using the original recipe. Consisting of a marzipan center with pistachio and nougat, the sweet is then dipped into dark chocolate to form a perfect smooth ball. After spending a few hours to explore ourselves, we made our journey back to Vienna to be dropped off at the Vienna State Opera. 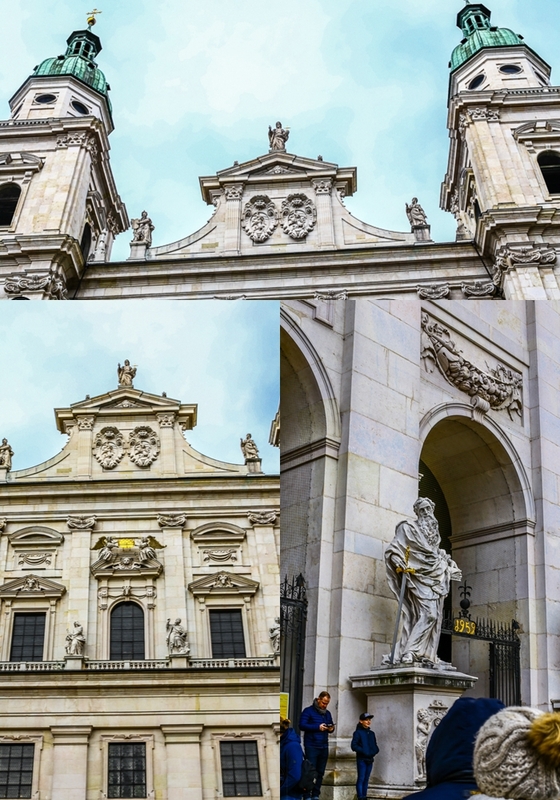 Our journey in Austria continued onto Innsbruck, Budapest and another final day in Vienna. Karan, it's a great excuse to go back to Austria :) You can visit Salzburg in any season.